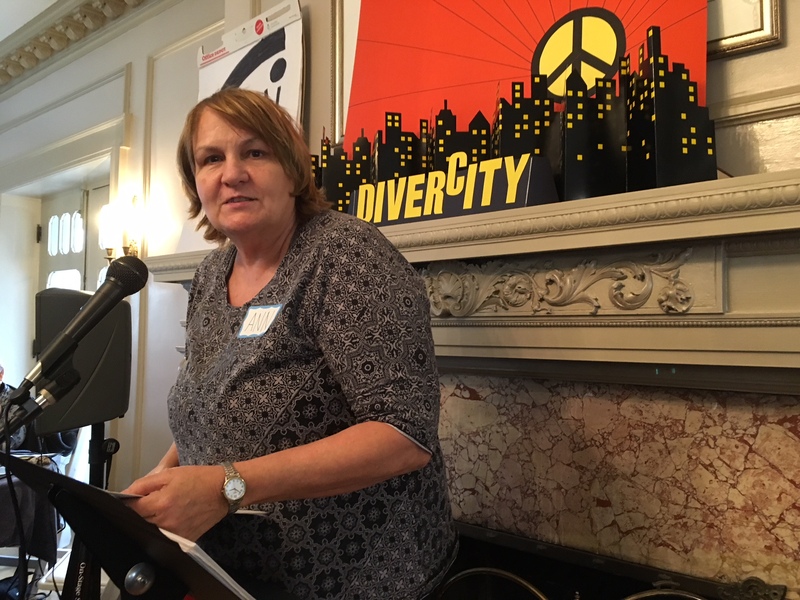 Note: Ann Suellentrop, of the PeaceWorks Board, shared these reflections March 11 during the PeaceWorks Annual Meeting, weaving together points from experts and peace groups. This is the Doomsday Clock. The Bulletin of the Atomic Scientists, begun in 1945 by those who helped develop the first atomic weapons, created the clock in 1947. They used the imagery of apocalypse (midnight) and the contemporary idiom of nuclear explosion (countdown to zero) to convey threats to humanity and the planet. This Jan. 25, the bulletin’s scientists moved the minute hand forward to 2 minutes to midnight, as close as it was during the height of the Cold War in 1953. 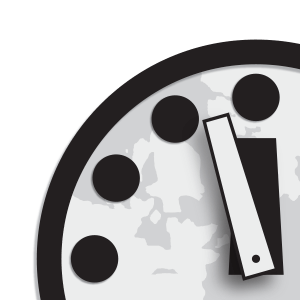 The clock, never closer to midnight, indicates the world’s vulnerability to catastrophe from nuclear weapons, climate change, and new technologies. What hope is there in these dire circumstances? We are the hope, believe it or not! Us regular folks! Did you know we all just won the Nobel Peace Prize? On Dec. 10, leaders of the International Campaign to Abolish Nuclear Weapons accepted the prize. ICAN is a worldwide network, including some groups I belong to: Physicians for Social Responsibility, the Alliance for Nuclear Accountability, and PeaceWorks! Why did we all win the prize? Because, on July 7, 2017, following a decade of advocacy by ICAN and its partners, an overwhelming majority of nations (122) voted to adopt the historic global agreement, the Treaty on the Prohibition of Nuclear Weapons. It will enter into legal force once 50 nations have formally ratified it. We can do many things to push for the Ban Treaty. Consider getting involved in some of the following issues and events. Right here in Kansas City, and in St. Louis, nuclear weapons are poisoning this and future generations. A group formed last summer, the Coalition Against Contamination, to address dangers across Missouri. They are dealing with the demolition of the old nuclear bomb parts plant at the Bannister Federal Complex in KC, which used more than 2,400 toxic chemicals since it started in World War II. Many sick and dying former workers from the plant want to alert the surrounding neighborhood to the massive and permanent pollution there. Meet with PeaceWorks Memorial Day at Bannister and Lydia, and then at the new plant—see page X. In the St. Louis area, the first uranium processing was done for the Nagasaki bomb during the Manhattan Project. The radioactive wastes there, illegally dumped, have caused numerous cancers and other illnesses without the public being aware of it until recently. One site, the WestLake Landfill, has an underground dump fire approaching the radioactive waste dump. This is the worst eco-disaster in America, according to both Erin Brokovich and Lois Gibbs. (Gibbs started the Superfund Program with Jimmy Carter because of the Love Canal problem.) The EPA recently proposed removing only about a quarter of the radioactive waste and covering the rest with a concrete cap and not buying out the families who live nearby. The St. Louis groups are asking for our help in sending our comments to the EPA; the public comment period will run through April 23. Online comments can be submitted at: R7_WestLakeLandfillPublicComments@epa.gov. The Alliance for Nuclear Accountability will have its 30th DC Days the week of May 20 in Washington, DC. ANA, a network including PeaceWorks, has helped stop many bad nuclear weapon ideas. We’ll visit lawmakers’ offices and discuss issues such as Trump’s atrocious Nuclear Posture Review that calls for smaller, more useable nukes and increasing spending for them past 1.2 trillion dollars up to possibly 2 trillion dollars over the next 30 years! I will be attending DC Days for my 10th year; contact me about scholarships at 913-271-7925. I will be giving a talk, with videos, on nuclear weapons and how to curb the hazards they pose. You’re invited to my program Thursday, April 19, at the Precious Blood Renewal Center, 2140 Saint Gaspar Way, Liberty, MO, 6-8:30pm, with a meal included. Nothing whatsoever can justify this ongoing, interminable crime against our descendants. We are the first generation which must ensure consciously and intentionally that we are not the last. It will take creativity and the energies of many groups to discuss the issues and take action—youth, environmental groups, racial justice groups, and peace groups. Let’s get together and smash that clock forever!